Anyway, my hubby was tasked with preparing the barbecued ribs, and of course that task is lovingly delegated to his wifey. I decided to use Pablo’s recipe for Fried Baby Back Ribs, and modify it for the purpose of barbecue. 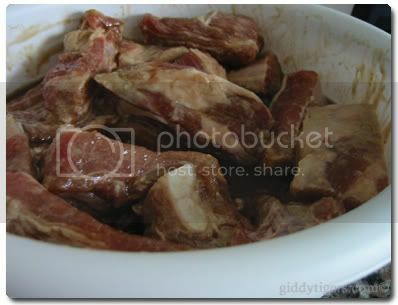 I had tried his recipe a few weeks ago, and my hubby had given the thumbs up for the taste, so it was just a matter of whether it would work fine on the barbecue grill. I gave the baby back ribs a real good marinade for about 18 hours, and because I had about 28 pieces to work with, I decided to move them around after a few hours so that they would all be equally marinaded, if there is indeed such a thing. They taste fantastic with hot steamed rice! This time, with the barbecued ribs, I was somewhat glad that I didn’t have to get rid of the oily kitchen smell after, because all I had to do before bringing it to the barbecue was to microwave the ribs on medium heat for about 3 minutes. This is just so the ribs are semi- to almost-cooked, at least on the inside, so that they won’t need to spend so much time on the grill later on. This was indeed an excellent tip from Pablo. I microwaved about 3-4 ribs at a time and brought them to the barbecue after that. 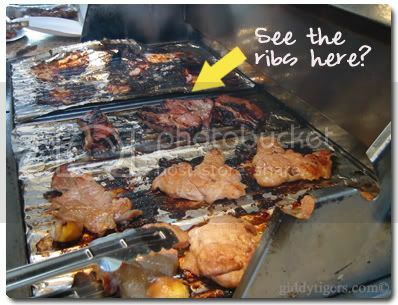 The Giddy Tigress says: Hope you’ll have a chance to get your hochiak bbq soon! I’ve just decided to go on a diet………….before visiting this site! Looks delicious! But I do not know where to buy baby back rib in penang. The Giddy Tigress says: I think you gotta go to the local butcher and indicate to him/her you want to have the ribs for barbecueing. It should be the most tender part of the ribs. The Giddy Tigress says: Now I am craving for some too! The Giddy Tigress says: Can taste just by looking ah? wahhhh looks nice. so how did u get rid of the oily smell from ur kitchen before that? The Giddy Tigress says: What to do, mop mop mop the floor and open the windows lo. hubby must be beaming proud of his wife’s culinary skills! i wish you happiness in america and good health forever. The Giddy Tigress says: Thanks misti, and the same goes to you too! 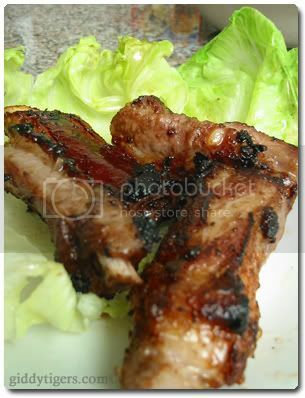 ow..baby back ribs!!! I lurveeee it soooo much! You seems enjoy life in US huh! The Giddy Tigress says: Yes, very much! Wah, Pablo dem femes now leh. Winter is best for BBQ. By standing next to the pit you don’t feel cold at all. The Giddy Tigress says: But it needs to be not too cold that you are shivering to bring the meat to the pit, right? Wah! Glad to see that all the ribs vanished by the day’s end. I was wondering how it turned out and looks like alls well, eh? By the way, thanks for the lovely card! Christmas greetings from the Pabla Clan to all the tigers out there! The Giddy Tigress says: Thanks Pablo for the recipe and for the Christmas greetings! Heheh..there IS such a thing about moving those babies around in their marinade…giving equal chance to soak up ’em juices! hahahah… have a great xmas and fulfilling new year ahead! The Giddy Tigress says: So I WAS doing the right thing! That’s good to know! 🙂 Big ol Texas size hugs!!! The Giddy Tigress says: Hey! Same goes to you and your family too! The Giddy Tigress says: Merry Christmas to you and your family too!